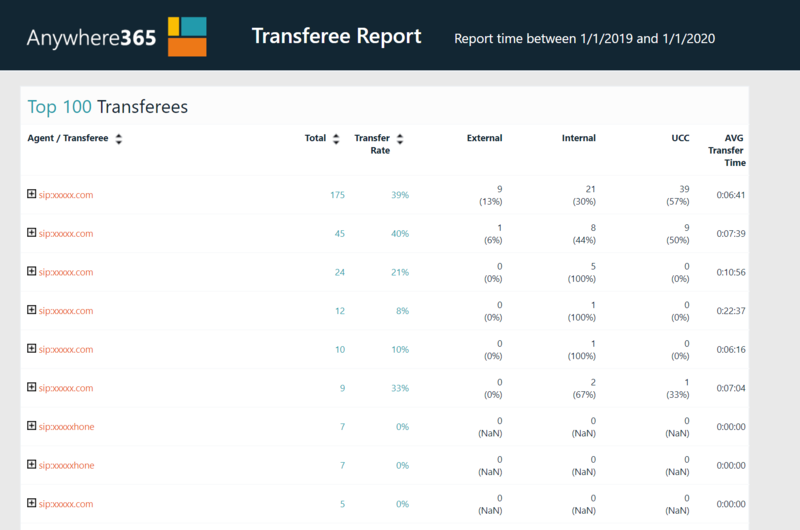 This report displays all useful information of Transfers. The Agent item displays the SIPThe Session Initiation Protocol (SIP) is a protocol to make multimedia communication (audio, video and other data communication) possible and it is also used for Voice over IP (VoIP). SIP has similarities with other Internet protocols such as HTTP and SMTP. address of the first Agent. The Transferee item displays the SIP address or phone number of the first Transferee. Percentage of dialogues that are transferred. External = Transferred to a phone number. Internal = Transferred to transferee on the same domain as the agent. Other Domain = Transferred to transferee on another domain as the agent. UCC = Transferred to a UCC. The Average Transfer Time displays the average seconds of time a Conversations was connected to the Transferee. Display the records of selected Agent. Open all closed groups in one click. Useful for report exports. Toggle the time (queuetime, talk time, etc) values between Average or Maximum.